There is a wide range of custom indicators for Forex, starting from the simplest ones, slightly improved versions of standard tools like Stochastics or RSI, and ending with complex systems, which algorithm may seem even too difficult for some programmers. However, in all this variety there are not so many tools that analyze not the price chart, but the transactions already made by the trader. Meanwhile, statistics can provide useful information, the analysis of which will improve the results of the trade. Today, we will analyze in detail the powerful Extra Report Pad indicator, which is able to replace the Myfxbook service in its functionality, or at least to compete with it. Despite the importance of analyzing statistics, there are practically no tools that can give a detailed analysis of the trader’s transactions (standard reports in MetaTrader 4 do not give a half of the necessary information). Of course, there are third-party online services like Myfxbook or FxBlue, but not everyone will be comfortable constantly synchronizing with extraneous sites, upload information and get statistics there, not to mention the fact that you need to constantly authorize on those sites. 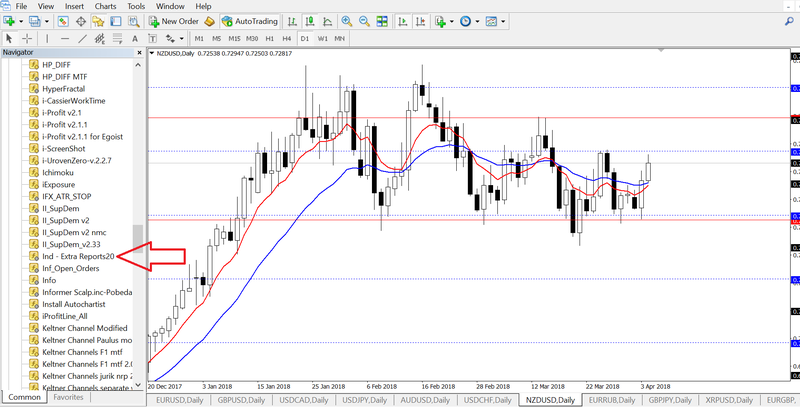 An excellent solution to this problem can be the Extra Report Pad indicator, developed by the Expforex team. This tool analyzes the trade statistics on a specific account and gives out all possible useful information directly to the trading terminal, which is very convenient. For example, when trading one strategy on several currency pairs, it is possible to determine which of the assets brings more profit and is better suited for this TS or when trading two or three advisers in one account, you can determine which ones trades better and which one loses profits. Export of the report to HTML is available, and it is more extensive than the standard statistics of the MetaTrader platform. After downloading the file with the indicator on your computer, you need to install it in the terminal. To do this, do the following. 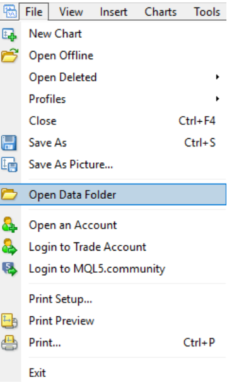 Open the Metatrader terminal and select the “Open Data Folder” command in the “File” submenu of the program’s top menu. After that, a folder on your computer with all the terminal data will be opened. There you need to open the “MQL4” subfolder, and then “Indicators”. Move the Extra Reports20.ex4 file to this folder. In order for this indicator to become active in the trading terminal, you need to restart MT4. 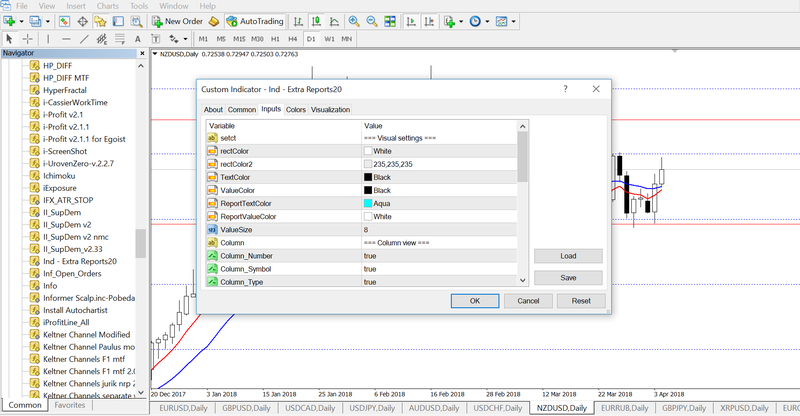 Having opened it anew, in the “Navigator” window on the left side of the platform we search for “Ind – Extra Reports”, and select the indicator setting. 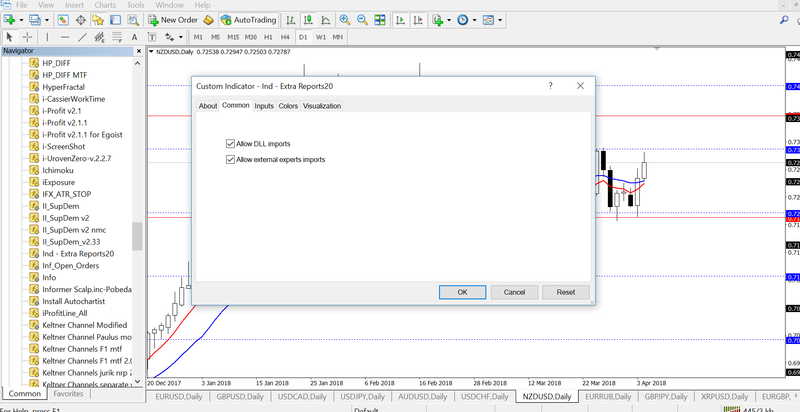 The Extra Report Pad tool window, where you can change some settings before the tool is placed on the chart will be then opened. In the indicator settings, the main tabs are “Common” and “Inputs”. In the “Common” tab, you need to allow importing DLLs and external advisors. If you don’t do that, MT4 can block some indicator processes and it will not work correctly. In the “Inputs” tab, you can set many details of the indicator, starting with the color styles and ending with what data will be displayed in the statistics window. Before installing the indicator, we recommend changing the background of the chart window to black and unmark the “Chart on foreground” checkbox in the chart properties that you can open by pressing F8. Otherwise, the indicator window sometimes passes the candles “through itself” and this prevents the correct display of statistics. The first part contains “Trades”, “History” and “All Deals” tabs. There you can see detailed statistics on open orders, already closed deals and on all positions, respectively. Max and Min – shows extreme deviations from the opening price. In the second part, the Reports and Distribution tabs. Reports is a detailed statistics on current trading results. Profit / Loss trades – the total number of profitable and unprofitable trades. In addition, you can see various relative values, such as the largest amount of profit and loss, the longest series of profitable and unprofitable trades, and so on. The Distribution DEALS block shows the transaction statistics for each specific asset. The first diagram shows the number of profitable and unprofitable trades for each currency pair. The second diagram is statistics only on profitable transactions. Here you can see the total profit from transactions for buying and selling for each asset. The third block is a similar statistic for loss-making orders. The Distribution TIME tab shows the statistics by time: the number of open transactions in any given period, the most profitable hours, etc. Since the release of the first version of the indicator, it has been constantly updated and adapted. In particular, the Distribution TIME tab appeared, which was not available in earlier versions. The interface of the tool is quite pleasant and convenient. However, we noticed some minor bugs. For example, accessing it from laptops with small screens, it can be difficult to expand the indicator window completely – the lower part constantly strives to “climb” under the bottom edge. In part, this can be achieved by changing the scale. In addition, the indicator periodically freezes, if you accidentally click the mouse outside its window, on the graph. After that, the tool ignores clicks, and you cannot switch the tab. In this case, the easiest way to solve is to drag another tool from the quotes window there – the chart will be updated, and the indicator window will be active again. 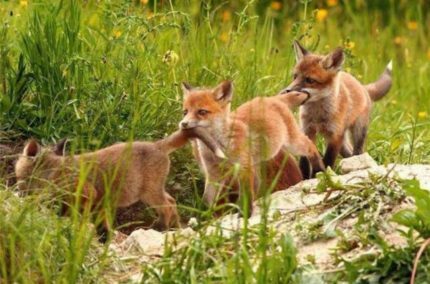 In general, the instrument makes a good impression. 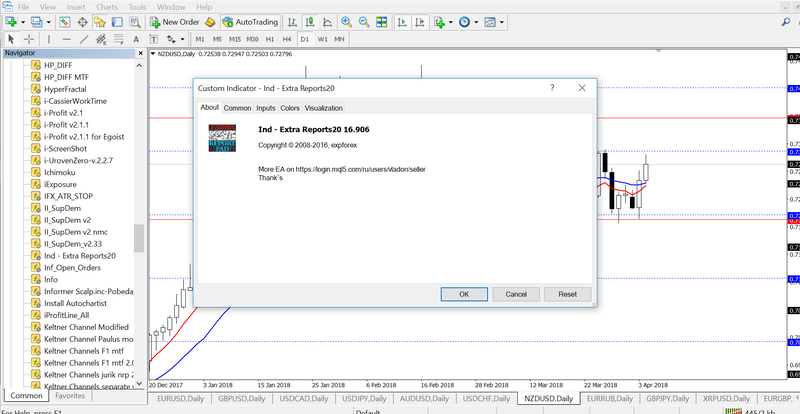 The Extra Report Pad significantly expands the standard MT4 statistics and is easy to use. He will be an excellent assistant to any forex trader!